Originally posted by Eileen Brown on ZDNet here. Amy’s Baking Company has earned itself a place on every social media marketing 101 course as a prime example of how not to use social media when a crisis occurs. 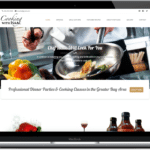 Amy’s Baking Company has had time to reflect on lessons learned since it crashed and burned on Facebook after appearing on the Kitchen Nightmares TV show. Here are some of the top ten social media rules you need to consider when dealing with your own social media meltdown. Attacking your critics online drops a pebble of discontent that ripples out across social media channels and attracts comments and flaming from trolls. These trolls have probably never visited your business, but have watched the ripples spreading. Social media watchers look to see how you handle a PR crisis and how you are managing your response. Without a crisis management framework in place, with appropriate responses for every type of complaint, companies are ill-prepared to manage firestorms like this. 2: Check that you are complaining to the correct company. ABC Cake Decorating Supplies in Phoenix received phone calls complaining about how Amy’s Baking Company treated its staff. ABC Cake Decorating Supplies has been trading longer than Amy’s Baking Company. ABC was assured that there would not be a problem when Amy’s started trading with a similar name in the local business area. Angry callers looked up ABC instead of Amy’s Baking Company to find the number and called the wrong business. 3: Do not say you’ve been hacked when you have not. Amy’s Baking Company posted ‘Obviously our Facebook, YELP, Twitter and Website have been hacked. We are working with the local authorities as well as the FBI computer crimes unit to ensure this does not happen again. We did not post those horrible things. Thank You Amy &Samy’. This type of comment only makes you look like you have no idea how the Internet works. To hack all of these sites simultaneously would be a feat that the hacker group Anonymous would be proud of. If your Facebook page has been hijacked, then the hackers will most likely have changed the password rendering it inaccessible for your use. Your Facebook business page uses the same Facebook password as your Facebook profile page. Samy and Amy’s personal Facebook profile was up and running throughout the alleged ‘hackgate’ issues with the business page. 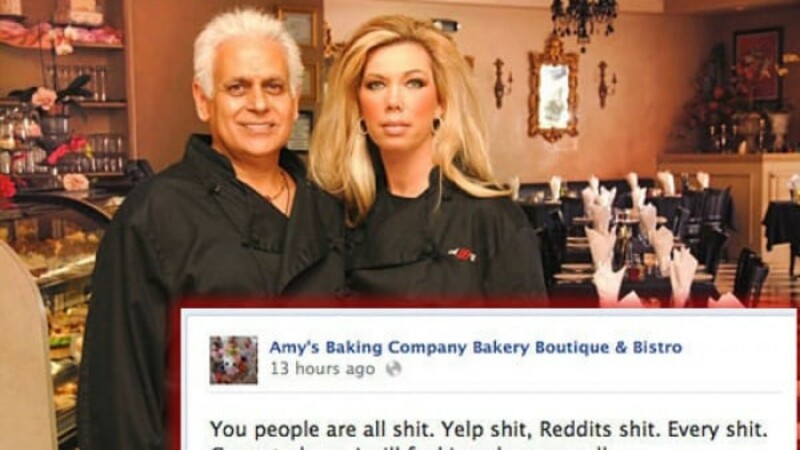 On sites such as Twitter and Yelp, readers can look at comments that were made about Amy’s Baking Company back in 2010 and know that screen grab tools can capture comments which subsequently get deleted. 4: Get your legal facts straight. The owners wanted to hold a press conference to tell their side of the story. Unfortunately, they did not read the contract that they signed when they agreed to participate in the TV show. The terms of the contract forbid them from talking about their experience on the show without prior approval from Fox. On Monday 20th May, the day before the grand opening, “all media-related persons, including bloggers” were prevented from attending the reopening. The Internet is bigger than you. People on the Internet have more time than you. Your comments will go viral if you continue to respond. You cannot correct the entire Internet. Even if you tried in your mission, the WayBack machine will provide more evidence for the trolls to poke you again. 6: Do not respond immediately. If you slam that response to an email and hit ‘Reply All’ in your ire and urgency to respond, remember that social media has its rules too. Work with your PR person to create an acceptable response and reply with an appropriate and timely tone and manner. Do not leave issues unanswered, and conversely do not reply in the heat of the moment leading to a flame war. Customers would like to be treated with consideration, not insults. Swear words and disparaging comments about customers are a definite no-no. 7: Don’t use images directly lifted from other sites without permission. Images are subject to copyright. When an image is uploaded by the owner of the image, then the rights remain with the owner of the image. Check for creative commons licences, attribute where necessary. If you made the food then take photos of it — or use the image provided by the actual bought product. If you try to pass images off as your own then you will be called out as these images from Pinterest and this Food search blog shows. If the concerns are valid, then admit, apologise and amend. Do not delay, deflect and defend. If you have been called out for buying in packaged goods instead of baking them onsite then have the grace to admit it. Reports of the grand opening generated significant interest from the gawkers that were waiting for more histrionics. However, the grand celebrations were muted as bloggers were prevented from attending the event. Interest is fading fast as the Internet and media moves on to the next newsworthy site. However, your story could run and run. Arizona Central reports that Amy’s Bakery is considering offers to star in a TV reality show. Perhaps a little train crash reality TV with your ‘home made’ pizza?